Indiana Mothers For Custodial Justice: Another Crooked Marion County Judge Caught: Adios Muchacha! Another Crooked Marion County Judge Caught: Adios Muchacha! Indianapolis - Teens are warned every day not to text anything inappropriate, and definitely not while behind the wheel or in the classroom. But it's a message that escaped a Marion County Juvenile Magistrate. She was fired for texting violations while hearing cases. Most assume unrestrained texting is a juvenile problem. At the Marion County Juvenile Court, where camera phones are banned, it isn't just troubled teens with busy fingers but a magistrate caught breaking the rules. 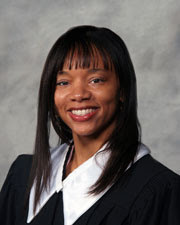 According to a court disciplinary record obtained by 13 Investigates, Magistrate Danielle Gregory engaged in inappropriate conduct, texting a married male employee in the middle of more than one juvenile hearing. Outside the court, visitors couldn't believe it. "Really?" questioned one mom while another man chimed in, "That's crazy." Ashley Wingler, who was told she couldn't bring in a cell phone because it would interrupt proceedings, found it just as troubling. "The judge should be more interested in the hearing instead of texting on the phone," she said. In fact, Gregory's supervisor writes in the disciplinary record that "Multiple text messages were sent from [Gregory's] cell phone number to [the male employee's] cell phone during court hours including times [she] was on the bench conducting court sessions." "Text messages were sent from your phone...on August 7th during a court session...and the messages included sending three pictures of yourself," the report read. "That's inappropriate. You on your phone and texting, sending pictures while you're having court, that's inappropriate," said Robert Lasley as he awaited a hearing Monday afternoon. Within less than an hour outside the facility at 2451 North Keystone Avenue, nearly a dozen parents were turned away from the juvenile court because of camera phones. But it might surprise some to learn that the Marion Superior Court does not have a policy against texting from the bench. Instead, Gregory was terminated for violating court policies, including: "committing any act while off duty that would discredit the Court," and for "immoral, unprofessional, or disruptive behavior while on duty." According to the disciplinary report, the male employee on the receiving end was assigned to mentor families in the court. Indiana Supreme Court Spokeswoman Kathryn Dolan told 13 Investigates, "Behavior for judicial officers, including judges and magistrates, is guided by the Indiana Code of Judicial Conduct. And while the code does not specifically deal with new media, it does provide specific and detailed information on how judicial officers are required to behave." "She should have been fired, you know. Definitely shouldn't have been doing that. Especially being a judge...she should have definitely known better," said Jim, the father of an incarcerated teen being held at the center, agreeing with the decision to fire Gregory. "I think that's terrible," added Tavia Norman, in disbelief. "Of course I would want them paying attention to what's going on. Shouldn't no judge or nobody should be texting on the cell phones," she said.